Ancient in its origins, Quinoa (pronounced KEEN-WAH) has been a staple in it’s native lands of Chile, Peru and the colonies in the Andes Mountains of Bolivia, for almost 5,000 years. Quinoa translated in the Incan language meas “Mother Grain” and was once considered “the gold of the Incas.” While Quinoa is commonly referred to as a grain, similar to buckwheat and amaranth, it is grown from an edible leafy green vegetable plant relative to Swiss chard, sugar beet, table beet, and spinach whereas grains are born from grassy plants. The seed like granule comes in a range of colors that vary from white, yellow, and pink, to darker red, purple, and black. 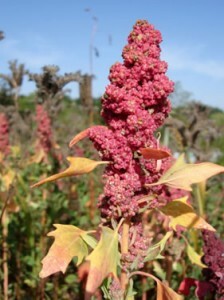 Quinoa may be eaten hot or cold in salads soups, stews, pilafs and casseroles. Quinoa is used in bread, muffins, bagels, cookies, pancakes, granola and other baked goods. Use Quinoa in the place of potatoes, couscous and rice. It is also a yummy nutritional replacement for oatmeal. Top with a drizzle of honey, nuts or berries. Quinoa is a complete protein and an excellent source of magnesium, a mineral that helps relax blood vessels. Increased intake of magnesium has been shown to reduce the severity of migraine headaches and arteriosclerosis. 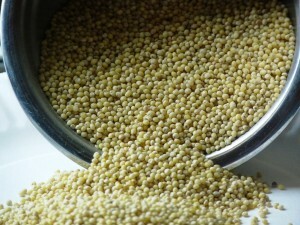 To prepare quinoa, always rinse it as you would rice to remove any powdery residue. Bring one part quinoa and two parts liquid to a boil; cover and reduce to a simmer for about 15 minutes or until the grains are translucent.